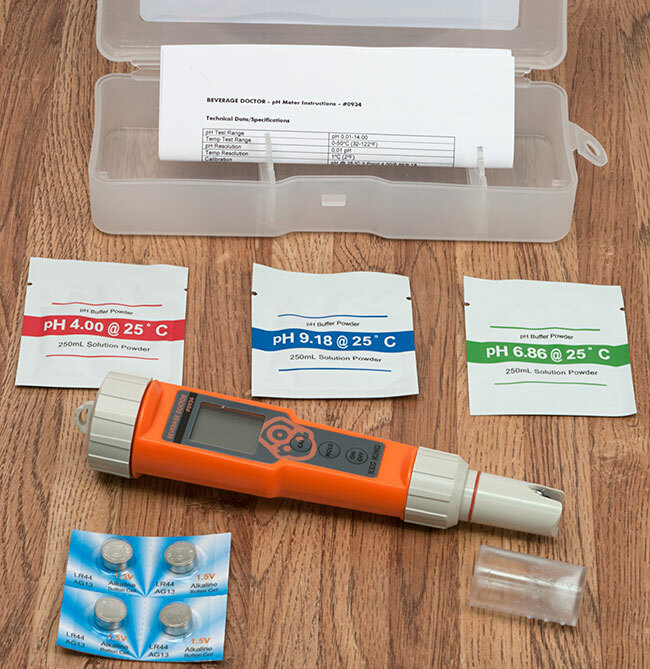 A quality, water resistant pH meter with triple point calibration, affordable replaceable electrode, automatic temperature compensation, and a water proof cap with a unique sponge storage solution retainer. Most pH meters only have single or double point calibration. This means they can only be calibrated at 4.0 and 7.0 pH. This meter has triple point calibration, which means it can also be calibrated at 5.5 pH for greater midrange accuracy. No manual calibration -just put the PH meter into the buffer solution that comes with it andthen hit the calibration button. Home brewing puts a lot of stress on the electrode, and electrodes only last for a few years. Especially if you are testing hot wort directly from your mash tun. If you know anything about PH meters you will know that the electrodes are not difficult to damage in a brewing environment and have a tendency to fail over time. Why spend all this money on a good quality pH meter if you can't replace the electrode? Unlike other units, the replacement electrode does not cost almost as much as the meter. This includes 3 packs dry concentrate buffer solution, for calibrating at 4.0 pH, 6.86 pH, and 9.18 pH. Just add deionized or distilled water and store in a glass jar and the solution will last 3 months. We also recommend you purchase Storage Solution (not included, you will be given a chance to buy this when you put this in your cart). 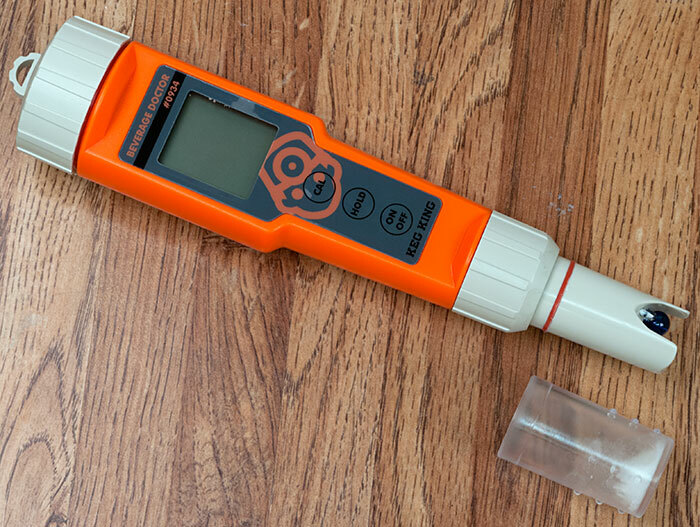 Any good quality PH meter you get will include ATC. This additional feature means the probe needs to have a small temp probe at the end so it can compensate for high or low temperatures. Lets face it, you are not going to wait for your wort sample to cool down to 68° F.
The main reason why PH meters fail over time is because the electrode dries out. If your PH meter is left with a dry probe the storage solution evaporates through the glass membrane. Unlike most meters, the cap on this meter has an o-ring and is water tight. In addition, it has a small sponge on the bottom to hold Storage Solution. To keep your electrode in best possible solution we recommend you clean with water then store in Storage Solution inside the cap . This will keep your readings accurate for several years. Click HERE for this meters manual in pdf format. i bought this to replace a cheaper meter that gave inconsistent results. i've used it on one batch, which was kettle soured. i took 2 readings during the mash, which i compared to test strips. also took readings at 4, 5 and 6 days to monitor souring. the readings were consistent and matched the test strips (as well as they could be read). Can I calibrate it with a pH 7.0 solution? That is the one I have available but it keeps reading 6.86. You should be able to if the solution is made by Milwaukee.